We at Netphoria are excited to introduce the new, updated website design for Shockbox Consulting. This new, updated design is a perfect showcase for the specialty consulting team that prides themselves on achieving substantial saving for their hospital administration clients. In addition to being so fortunate to design and build the website for Shockbox Consulting, we are also happy to add the company to our growing list of Search Engine Optimization Clients! We look forward to working with the Shockbox team to continue to build up their website and online presence so that we can help them achieve their online goals. 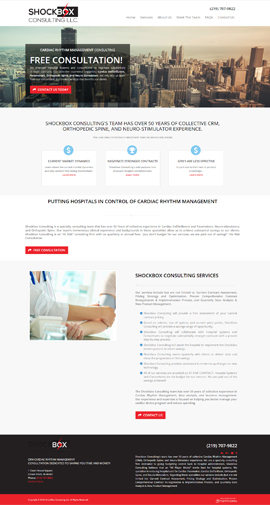 Shockbox Consulting's team has over 50 years of collective Cardiac Rhythm Management (CRM), Orthopedic Spine, and Neuro-Stimulator experience. They are a specialty consulting firm dedicated to giving budgeting control back to hospital administrators. Shockbox Consulting believes that an "All Player Model" works best for hospital systems. Take a look at their new, updated website and their social media pages. As always, our goal is to provide a customized experience for each of our clients. We are excited to show off Shockbox Consulting's new website design that will provide an informative, elegant and easy to use experience for their clients.